Hello friends. I will explain all the methods used to hack a website or website’s database. This is the first part of the hacking websites tutorial, where I will briefly explain all the methods used for hacking or defacing websites. Today, I will give you the overview, and in later tutorials we will discuss them one by one with practical examples. I will also tell you how to protect your websites from these attacks, as well as other practices such as hardening of SQL, hardening of web servers, and key knowledge about CHMOD rights. Note: This post is only for educational purposes only. What are the basic things you should know before website hacking? 1. Basics of HTML, SQL, PHP. 3. Basic knowledge of how servers work. 4. And most importantly, expertise in removing traces, otherwise, you will certainly suffer consequences. I will explain the fourth point, that you should be expert in removing traces, in my future articles. Traces are very important. Please don’t ignore them or you will experience a lot of problems. Keep reading, or simply subscribe to our posts. First of all, what is SQL injection? SQL injection is a type of security exploit or loophole in which an attacker “injects” SQL code through a web form or manipulates the URLs based on SQL parameters. It exploits web applications that use client-supplied SQL queries. The primary form of SQL injection consists of code being directly inserted into user-input variables that are concatenated with SQL commands and executed. A less direct attack injects malicious code into strings that are destined for storage in a table or as metadata. When the stored strings are subsequently concatenated into a dynamic SQL command then the malicious code is executed. Cross site scripting (XSS) occurs when a user inputs malicious data into a website, which causes the application to do something it wasn’t intended to do. XSS attacks are very popular and some of the biggest websites have been affected by them, including the FBI, CNN, eBay, Apple, Microsoft, and AOL. Cross-site scripting holes are web application vulnerabilities that allow attackers to bypass client-side security mechanisms normally imposed on web content by modern browsers. By finding ways of injecting malicious scripts into web pages, an attacker can gain elevated access privileges to sensitive page content, session cookies, and a variety of other information maintained by the browser on behalf of the user. 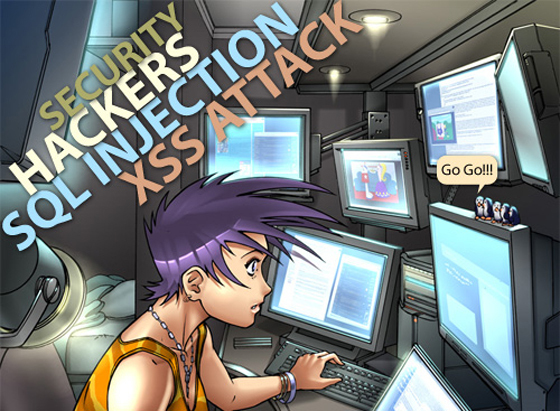 Cross-site scripting attacks are therefore a special case of code injection. I will explain this in detail in later hacking classes, so keep reading. Remote file inclusion is the vulnerability most often found on websites. exploits to escalate his privileges and take over the whole system. Local File Inclusion (LFI) is when you have the ability to browse through the server by means of directory transversal. One of the most common uses of LFI is to discover the /etc/passwd file. This file contains the user information of a Linux system. Hackers find sites vulnerable to LFI the same way I discussed for RFIs. I will explain it in detail with practical website examples in latter sequential classes on website hacking. This is simply called distributed denial of service attack. A denial-of-service attack (DoS attack) or distributed denial-of-service attack (DDoS attack) is an attempt to make a computer resource unavailable to its intended users. Although the means to carry it out, the motives for, and the targets of a DoS attack may vary, it generally consists of the concerted efforts of a person or people to prevent an internet site or service from functioning efficiently or at all, temporarily or indefinitely. In DDOS attacks we consume the bandwidth and resources of any website and make them unavailable to its legitimate users. This category is not new, it is merely comprised of the five categories above, but I mentioned it separately because there are several exploits which cannot be covered in the aforementioned categories. I will explain them individually with examples. The basic idea behind this is to find the vulnerability in the website and exploit it to get the admin or moderator privileges so that you can manipulate things easily. I hope you all now have an overview of website hacking. In consecutive future classes I will explain all of these techniques in details, so please keep reading.